The DC Super Hero Girls has been a boon for DC Comics and Warner Bros Animation as the teenage superheroes have been opened up to a whole new generation of fans. The merchandise side has been doing pretty well too filling a hole in the market for younger fans. Season two of the fun digital shorts begins with 'New Beginnings' as Principal Waller asks Wonder Woman to recruit Supergirl to come to Super Hero High. Wonder Woman is living her destiny! As the newly appointed School Ambassador, she's taking the lead to recruit Supergirl to Super Hero High — until a sneak attack from villainess Giganta catches her off guard. 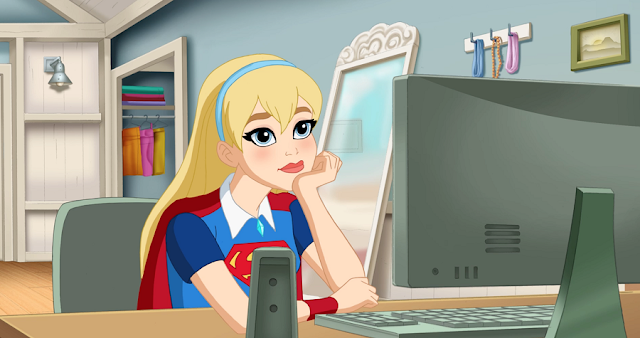 Voiced by Anais Fairweather, Supergirl like the other teens is finding her way and growing up while facing normal challenges. It's something that appeals to Fairweather about humanizing these legendary comic books heroes. "Her dynamic is that she really is genuinely learning about herself and learning about the other girls at the school and wanting to take something from all of them,” says Fairweather. “I really believe she wants to learn from each one of them in their own way and become close to them and find her home here because she's so far away from her actual home. I could really feel that sense of her wanting to find her place." "I think so much of the time we're seeing women on television being pinned against each other, and it's so wonderful to have this show for young women so that they can see other women supporting each other and building each other up. It's important," she says. The show has a lot to offer, it's fun and exciting like in this episode when Wonder Woman has to battle Giganta, but really the ability to relate to girls is equally important. Supergirl isn't perfect, she's clumsy and unsure of herself at times, but is finding a way to control her powers to overcome her fears. She's learning to trust herself and hopefully that message of embracing your confidence carries over to the audience. "You see her constantly coming up against herself and questioning herself. Is she powerful enough? Is she ready? Does she have enough training? I think the biggest thing for her is really believing in herself. I so badly want young girls to believe in themselves and to take risks and to not let people stand in their way. It's so important to trust and to know that you can do this. I think a big thing is to call on help and to not be afraid to ask people for help. I think another one of her challenges is to not apologize so much."